Your kids are away at college; things are quiet around the house. However, college campuses around the nation are gearing up for the most stressful week of every college student’s semester… finals week! Do you want to send your collegiate son or daughter a simple gift that says both “thinking of you” and “hang in there”? 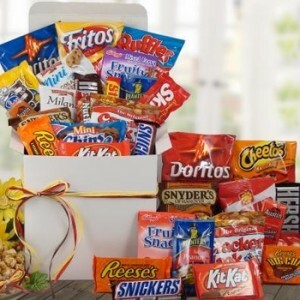 Consider sending a finals week care package from BisketBaskets.com! Below are just a few of the amazing care packages that will help any student cope with the stress of finals week. Coffee and Donuts Care Package: What college student doesn’t live off coffee all semester long? Not only will the delicious and aromatic coffee and donuts satisfy your student’s taste buds, but the sugar and caffeine is sure to keep them alert and in the study zone. Party Animal Care Package: Give your little study bugs something to enjoy after finals with this fully loaded party animal care package. Stuffed with delicious candy and salty treats, your college kid will be poised and ready to celebrate! Colorado Care Package: You don’t have to live in the Rocky Mountains to enjoy Colorado anywhere! This beautiful Colorado care package is stuffed with various treasures from the great state Bisket Baskets calls home. With delicious tea and coffee, this is the ultimate exam week relaxation kit. Skittles Care Package: Your favorite student will be tasting the rainbow at the end of a stressful semester when you send them this Skittles care package for exam week. The delicious fruity flavor of Skittles is the perfect reminder that while they may feel overwhelmed, not everything is so bad after all! 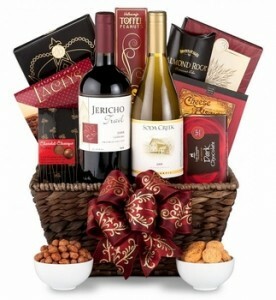 We’re Celebrating Spring with Great Gift Baskets on Sale! While we strive to keep our prices as low as possible year-round, we do like to offer up some attractive sale prices on select baskets whenever possible. And, it just so happens some of our most popular picks are on sale right now! We spread our sale across a variety of options so everyone can enjoy some savings. When browsing our site, keep an eye out for bolded sale prices. Or, check out the 3 favorites below to get started! Get Well Cookie Gift Box – Regularly $44.99 – On Sale for $38.99! Have a friend or family member miles away that you’d love to give a reassuring hug to, but simply can’t make the trip? Send your ‘Get Well’ wishes the sweetest way possible with this cookie-packed gift. Each box is bursting with 7 ounces of white chocolate macadamia cookies, 7 ounces of oatmeal pecan cookies, and 3 adorable hand decorated gourmet cookies, one shaped like a doctor’s bag, one like a nurse, and one spelling out ‘Get Well’ amidst colorful sugar flowers. Gourmet Gift Box – Regularly $36.99 – On Sale for $31.99! This supreme sampler makes a gorgeous gift for birthdays, anniversaries, to celebrate a new job, or just about any occasion. It is both attractive and tasty, with a diverse assortment of treats tucked inside. We fill each box with CaPeachio’s crackers, Wine Vineyard cheese spread, Dolcetto chocolate pastry, and 3 hand decorated cookies. Dog Gift Basket – Regularly $39.99 – One Sale for $34.99! Know a precious pooch who is a bit under the weather, or could simply use a little pick-me-up? This adorable set comes complete with a stuffed ‘Chill Pill’ toy and generous bag of yummy Harry Barker treats (we haven’t actually tried them ourselves, but our dogs love them!) Baked in the USA, these all natural treats are perfect for dogs with sensitivities or allergies.